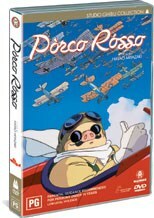 Porco Rosso is a fun filled adventure from the master animators at Studio Ghibli. Set in the ‘20’s, the movie is based on high flyer Porco Rosso who is an ace pilot cursed to take the form of a pig trying to deal with a world full of humans. Taking on the role of airborne law enforcement, Porco is faced with a challenge when he has to return to Italy and get his boat plane back up and running when it is shot down by pilot for hire Curtiss. The movie is filled with adventure, thrills and morals all the way through. Ghibli are masters at telling tales that really pluck at your heart strings. The animation is a delight to look at despite the fact that the animation was done a little while ago, the feature is fun to watch and there is very little to complain about in terms of quality. One of the highlights of the movie is Porco and his interaction with Fio, the young mechanic that overhauls his plane and makes it even better than it originally was. The action scenes that take place during the movie are fantastic and you really get the feeling that you are part of this wonderful world that Ghibli has created. Of interest is the extras which contain the standard storyboards but as an added bonus we also get some insight into the feature from the producer Toshio Suzuki. But extras aside, this movie is a gem and will make a great addition to your Studio Ghibli collection. This movie presents the option of both the Japanese and English soundtrack for your enjoyment. Personally I am of the opinion that if it was made over there, play the Japanese soundtrack. I’ll leave that one up to you!